Pagudpud is such a small coastal town that you can actually explore it in a day, but for us who wanted to take it easy and slow, we opted to spend two nights in an unassuming pension house in Saud Beach to give us ample time to appreciate Pagudpud's naturally beautiful sites. Here, pacing is the key. Standard rate for this tricycle tour is Php 600. Our tour guide and tricycle driver was the highly-recommended Kuya Lenzer (+639068185735). A tricycle tour can accommodate a maximum of four (4) persons. Should you require an air-conditioned van, Kuya Lenzer also has one. Kuya Lenzer picked us up at 8:00 am from Rey's Place right after our scrumptious breakfast of Ilocano longganisa (sausage), garlic rice, and scrambled eggs in Casa Victoria. Our first stop was Kabigan Falls, a 112-feet waterfalls tucked in a forest about 1.5 kilometer away from the main road. The drop off is about 10 minutes away from Saud Beach. Here, you need to pay Php 10 per person as entrance fee and Php 100 per group as guide fee. The trek takes about 30 minutes passing through rice fields and paved forests. There's a part where you need to walk on big rocks and low cliffs. Generally, the trek is easier than that of Ditumabo Falls in Aurora or Ulan-Ulan Falls in Biliran. There are some huts and benches along the way, so you can take a break whenever you feel like you need to catch your breath. Best to go early morning when the sun is not scorching hot yet. Make sure to wear comfortable footwear, and be prepared to get wet and muddy! So, is it worth the trek, you ask? Well, it is! Kabigan Falls may not be the tallest nor the widest nor the most spectacular falls in the country, but it sure has a charm of its own. Its rugged, untouched appeal is worth the effort. Test the frigid waters and have a dip! We left the falls as soon as the rain started to fall. It was already amihan (northeast monsoon) season then, so rainshowers and stronger waves were on in this part of the world. At the drop off, there is a bathroom that you can use should you wish to change your wet clothes before going to your next destination. Our next stop was the Patapat Viaduct. The fourth longest bridge in the Philippines, Patapat Viaduct is one of the major projects of the former president Ferdinand Marcos. The concrete bridge straddled by the Pasaleng Bay--where the Pacific Ocean meets the West Philippine Sea--lines the hillside of northern Pagudpud and connects the provinces of Ilocos Norte and Cagayan. On one side are rocks where waves seem to splash endlessly. For those who doesn't want to trek all the way to Kabigan Falls, a good alternative would be the Agua Grande, a picnic place overlooking the sea. On its sides is a cold stream of water from the mountains crashing on rocks. Next stop was what they call "Paraiso ni Anton." Named after a former congressman who was a very good friend of the Marcoses, this spot is a famous stopover for tourists and locals alike. Its a small forest beside the main road that as mini waterfalls and a grotto. There's nothing paradisaical here so if you are pressed for time, you can actually skip this. To me however, this was a good spot to say a little prayer so that your entire trip be blessed and safe. You can also buy some souvenirs here. Timmantang Rock, our next destination, is a bell-shaped boulder right on the shore. Aptly named, "timmantang" means "bell" in Ilocano. Nothing much to do here, too, but to take photos! As if saving the best for last, we headed to Bantay Abot Cave and Blue Lagoon soon after. Bantay Abot Cave can actually be seen from a distance when you are right next to Timmantang Rock. 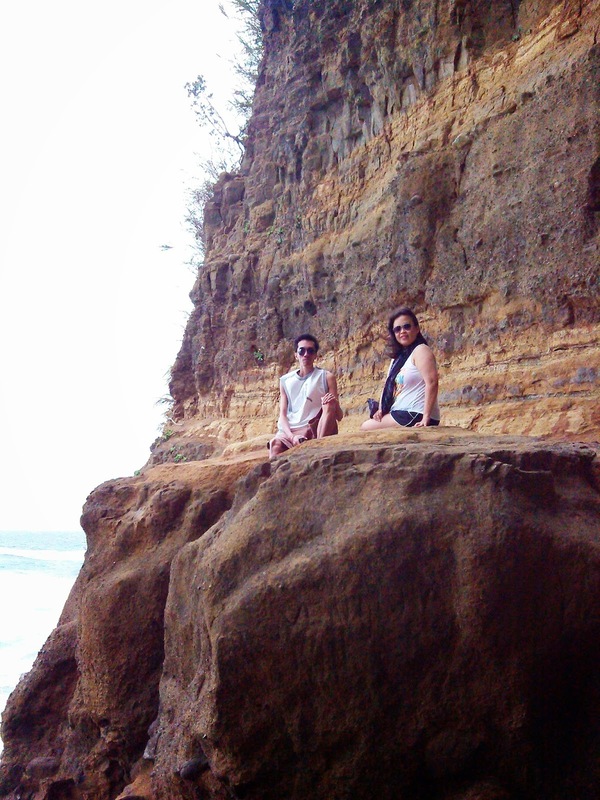 For me, this eco-destination is the highlight of the Pagudpud North Tour. "Bantay" means "mountain" and "abot" means "hole" in the local dialect. 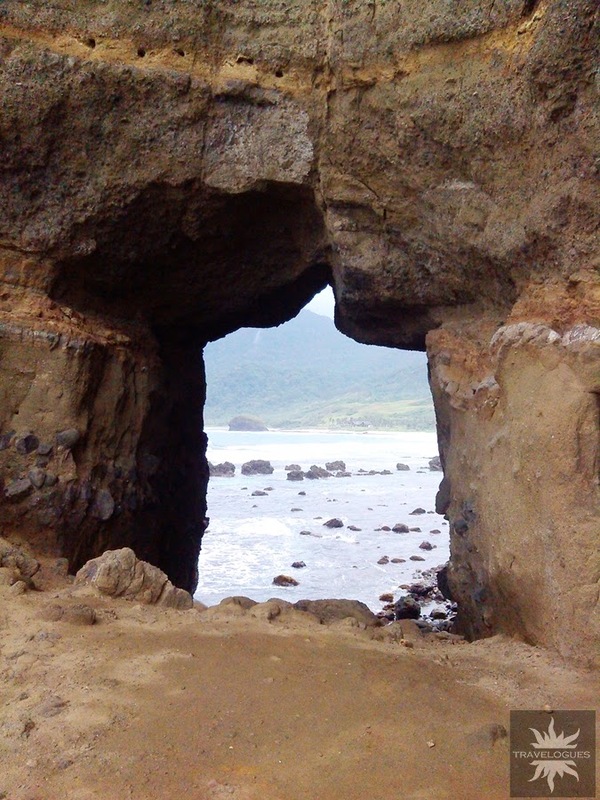 It is a littoral cave formed by the roaring waves of the sea for many years. 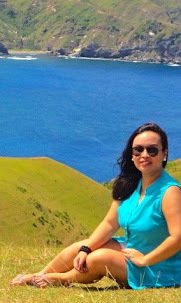 There's a "Batanes-ish" feel in this site, and it is perhaps the reason why I like the place so much. To go to the opening, you would need to walk (and sometimes climb) on big rocks. It is actually an easy trail but can be a bit slippery at times. Our final destination was the famous Blue Lagoon. 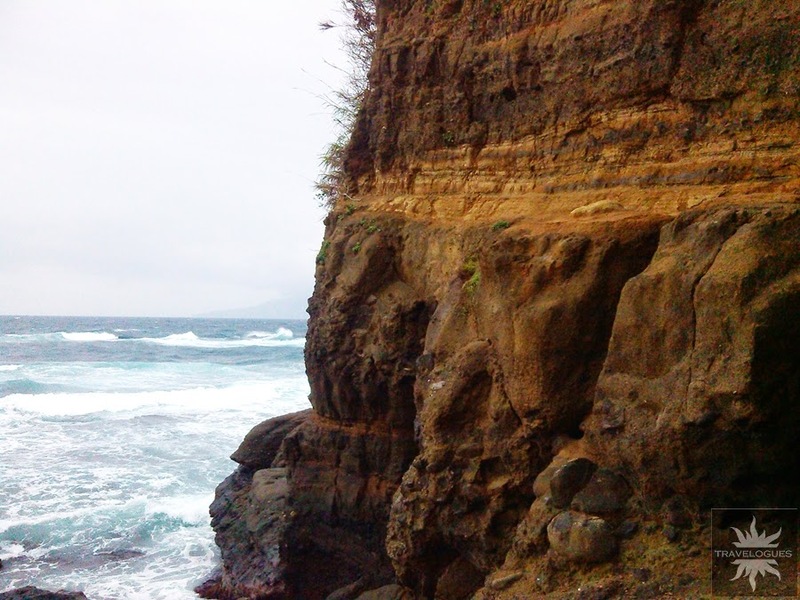 Also known as Maira-ira Beach, this site is said to be the northernmost part of mainland Luzon, right before crossing the vast sea to Babuyan Islands and Batanes. That being said, expect gigantic waves from October to February when wind blows northeast. So why blue? This cove turns quiet and azure during the summer months, on until the southwest monsoon season. It was actually nicer and more pristine before, but with the side by side developments going on, the place now has that Puerto Galera- and Boracay-like party crowd. There are also resorts here, including the infamous Hannah's (which continues to expand to this day), as well as pension houses and homestays. For me, the resorts here are overrated and overpriced. Tourists usually have their lunch here. 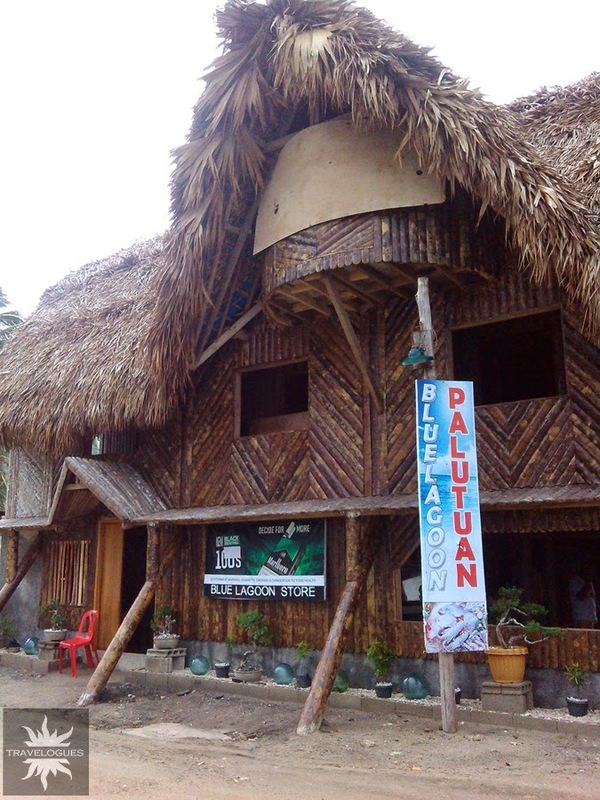 A famous dining hub is the Blue Lagoon Palutuan where you can select among readily cooked dishes or opt to have some yellow fin tuna, pork, shrimps, or chicken cooked the way you want it. Cooking charge on top of the ingredients which usually cost 200 and up is Php 100 per dish. Rice is Php 20 per cup. They can prepare your meals while you are beach bumming on Blue Lagoon. After having lunch, we asked Kuya Lenzer to bring us back to our homestay in Saud Beach so we can have a dip and wait for the sunset. He was happy to oblige, and so that was the end of our North Tour.